The young woman at the bar seemed intent on being alone, despite being dressed to kill. Bedecked in an eye-catching red dress, her golden hair cascading over her shoulders, she continued to sit at the bar, slowly sipping a Rum and Coke. Several slick-looking guys came over to hit on her, but before most of them even got the first word out, a piercing glance from her bright green eyes silenced them immediately. They would stop for a moment, as if paralyzed, then gulp, and dash off. Anyone who cared to look might have noticed them lewdly tenting their shorts as they did so. After a few moments, most of the people there opted to just leave her alone. And so she sat for nearly two hours, watching people flirt and dance and drink, while the band on stage played a rocking beat. She seemed nearly ready to leave, when suddenly, someone entered the dance floor who immediately caught her eye. She smiled and watched as a tall, muscular clean cut young man sauntered into the crowd. Almost immediately, several women clustered around him, wanting to be the first to bump and grind with such a hearty specimen. Because, yeah, you people come here for the geography lessons. 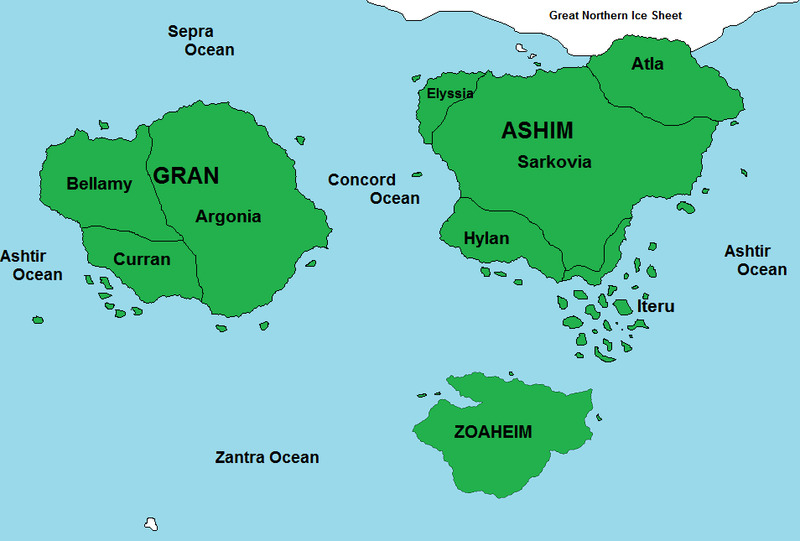 First time making a fictional map, so I kept it pretty basic, didn't bother including terrain features like the Titan Mountains (which divides the three countries of Gran), the Elyss Desert (which separates Elyss from the rest of Sarkovia), and there's probably a couple hundred little islands I'm missing and I didn't bother with the major lakes and rivers that I'm sure are there somewhere, but most of those are probably too small to see at this scale anyway. So, not bad, I'd say, mostly shaped how I had it in mind, though I'm sure the figures are probably off from my guidebook descriptor. Oh, well. Funny, thing, actually had to make up the ocean names on the spot, since I never thought about those prior to this. Yeah, I know, it ain't erotica. Sorry for the lack of content lately. Summar/fall just seems to be a less productive time for me, and I haven't fully resolved my writing conflicts yet.